On Feb. 7, 1997, Suzan was a passenger in a car coming back to San Diego, CA., after helping a "friend" retrieve the car from Tijuana, Mexico. They were stopped at the border, and agents found 43 pounds of heroin hidden in a secret compartment welded inside the gas tank. Upon arrest, the driver, Jenny, immediately confessed to being a regular drug smuggler, and told the authorities that Suzan knew nothing about the drugs, and they were preparing to just let her go. However, after several hours of intensive interrogation and coercion, Jenny changed her story, and agreed to implicate and testify against Suzan, in exchange for minimal bail and a light sentence. Jenny was treated generously for her 'cooperation' and betrayal. Suzan was held without bail, isolated, humiliated, and even spent 3 1/2 weeks in 'the hole', where she was sexually harassed, and chained and roughed up on a regular basis. This was not punitive; she was told it was administrative detention; a result of being 'uncooperative'. 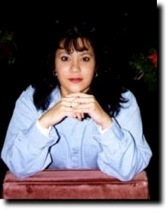 At trial, the only real evidence against Suzan was Jenny's heresay testimony, and yet she was convicted on 3 counts of drug trafficking and conspiracy. After trial, Jenny was rewarded handsomely for her betrayal and perjury; she received an option of a 6 month sentence at a minimum security 'boot camp'. On October 23rd, 1997, Suzan was sentenced to 6 and a half years in federal prison. I think the judge did everything she could to go easy on Suzie. The judge and even the US Attorney admitted that Suzan had no idea there was heroin in car, and yet she was convicted and sentenced for conspiracy to import 43 lbs. of heroin. It's a sign of the insanity of the drug war that we all had to consider ourselves lucky. Suzie could have gotten so much worse. No other arrests were made, even though the government had ample opportunity to bring in the alleged 'kingpins'. Destroying Suzan's life will not keep one molecule of drugs off the street, or protect society one tiny bit..
Suzan has no prior criminal record whatsoever, and has never been in trouble with the law before. She was estranged from her abusive husband, and simply fell in with the wrong crowd. She has not seen her son in almost a year. Her parents are in their seventies, and may not live to see the end of her sentence. In a time of great turmoil in her life, she made a stupid mistake; she naively let herself be used and manipulated by ruthless and accomplished criminals, and now our government is trying to destroy her completely. She has been locked up for many months now, with no end in sight. This madness must stop. Suzan is also featured in War on Drugs; War on Women by Maia Szalavitz, from ON THE ISSUES: THE WOMEN'S PROGRESSIVE QUARTERLY; Winter 1998 issue.